I am still working with Craft Room, the Cricut design tool, and learning more and more about it every day. You know I suspect people simply do NOT know what they are getting in to when they ask me to review something! Is that why Julia put my name forth as a potential reviewer? She knew I would work the thing to death, squeezing every last bit of info out of my play, and attempting to discover things to do with it that may not be immediately obvious? And that I am only ever going to be completely honest in my reviews? Will I ever get asked to do another? Perhaps not LOL! Anyway, if you read back you will see that I have been playing more with making TOOLS from the Cricut Mini more than projects or layouts or cards. I’ve done a lot of cutting of stencils from report covers and even made a few foam stamps – not a perfect process, but certainly doable. What is quite literally ALL OVER MY DESK and floor and side table is the results of my design and cutting. I’ll share more about the DESIGN process in Craft Room tomorrow, but for WOYWW it seems better to show actual creative work! So first we have a stencil I cut using a basic Cricut image that I duplicated, rotated, hid contours, etc. 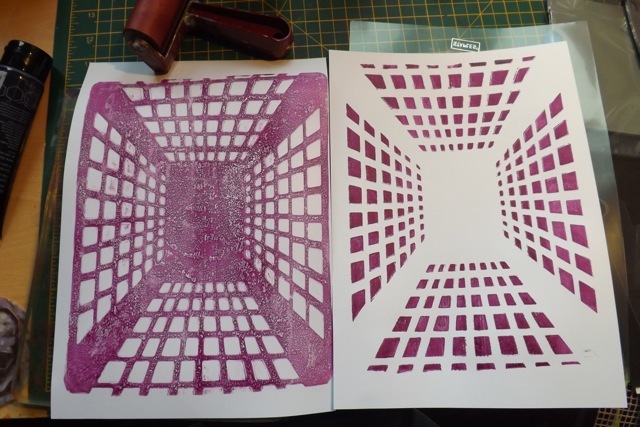 I used it for my Gelli Plate, pulling both thru the stencil and then again after removing the stencil. And another one, this one created from dozens of individual characters, but well worth the effort. I really like it! Same deal – thru the stencil and once removed. I think it would have been MUCH better had I used a lighter colour as the base, especially when I added the foam stamps in black – they would have stood out that little bit more. 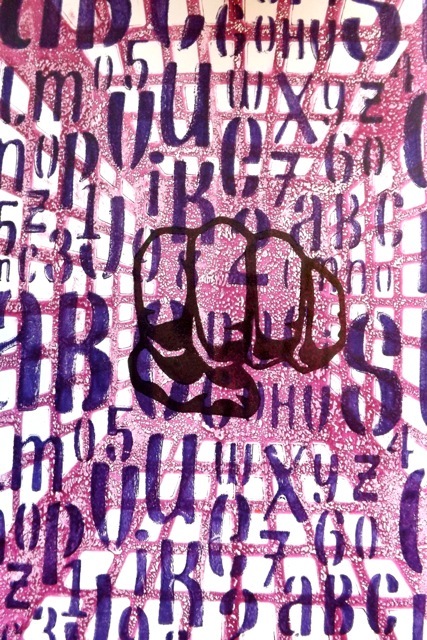 I also thing masking the center so the fist punching thru didn’t have the letters behind it would have improved the design. And I think it did. Now, it’s time to scamper around the desks and see what else will inspire me. Life is finally settling down ever so slightly, so I hope to manage more than my commenters and the usual suspects that are on my watch list. I try to get to at least a few people at random, but I have never once made it thru every name on the list. One day…. 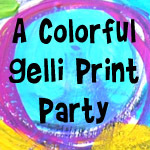 Categories: Gelli plate monoprints, stamping, stencils, WOYWW | Tags: Craft Room, Gelli plate, Stencil, WOYWW | Permalink. You are rocking the cricut and the Gelli Plate! Love the perspective in your print! Thanks for sharing with the party! I do like the framing. It’s pretty cool that you can manipulate the images to make them your own. Sounds like you have a lot of playing around to do! Thanks for visiting me already! 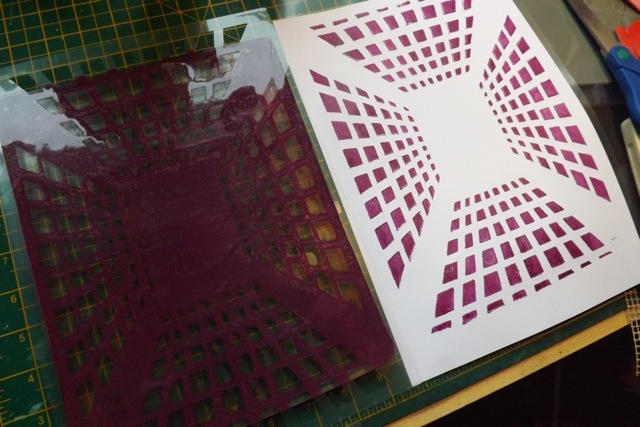 How cool to be able to design and cut any stencil pattern, the only limit being your imagination. I’ve succumbed and asked for a Gelli Plate for my birthday. I blame you entirely! I love, love, LOVE all the images you’ve made! The first one looks like you are looking up at some tall buildings and the letters one is just awesomeness! 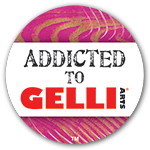 Oh wow, I am following you by email now, I haven’t yet played with my Gelli plate, need to make enough space first! Cutting stencils too, I love it! Part of me just wants to stop you and ask just what the heck are you talking about? Okay, okay! 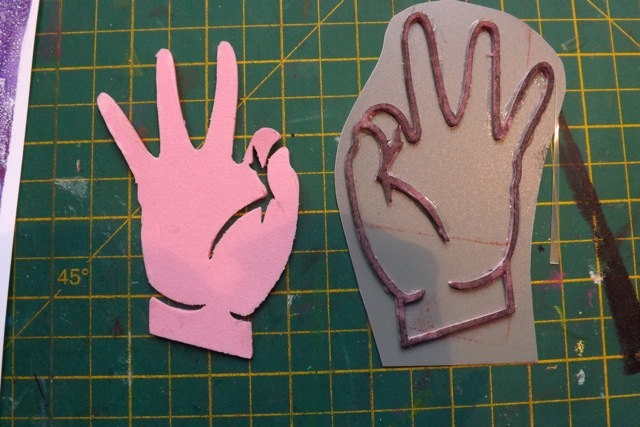 I know the circuit and the gelli plate, both of which I have no experience with. I’m sure you have lots of people with them now drooling over this and not wanting to wait to try it. I like what you’ve done, but I’m just going to sit back and watch, ‘kay? Sounds and looks like you are having a lot of fun! Wish I could come for a play date. I knew that you’d do things that other reviews wouldn’t and feel that makes you a valuable reviewer, was just a bit worried that you may not have time. But as usual, I see you’ve morphed into time-stopping mode and found some! Glad things are feeling a bit calmer..look forward to saying the same here in a few days!! 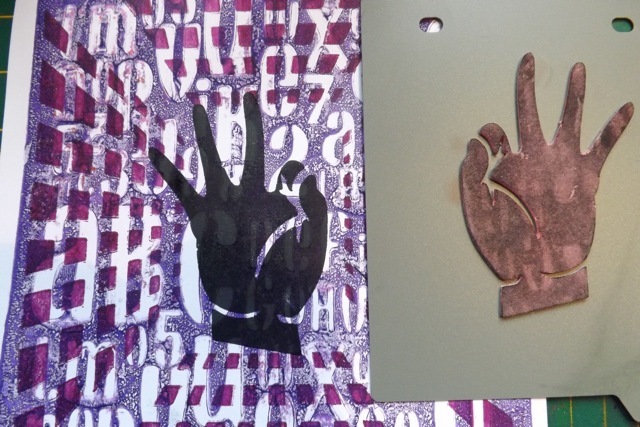 You make amazing stencils – I think you will make those big companies go out of business! 🙂 I wish I had a cricut but I guess it is too much of an investment for the little stuff I would use it for! I will be using the gelli plate on canvas – need to make a special present – I hope my idea turns out well – do you have any suggestions?? Goodness, you have been BUSY! Well done. oh wow just look at all those amazing things you have made using the cricut I will have to spend some time with mine having a proper play with the craft room. I have got the craft room set up but have not played with it yet but I may be coming back to you for some help and inspiration. I just love all the different layers! Wow, I love that stencil and what you have done with it.I can imagine this working well with fabric and fabric paints. Always enjoy reading your post they are so informative….., keep doing the reviews and giving your honest opion I love it! 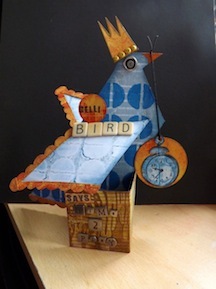 Love what you’re doing with your gelli plate.